Located just five minutes' walk from Liverpool Street Station, Old Spitalfields market is the perfect shopping destination. Open seven days per week, the impressive array of shops and stalls draws in shoppers from all over the South East. The main market days are on Thursday, Friday, Saturday and Sunday offering shoppers something different each day. The Thursday Antiques Market offers a breathtaking array of collectable vintage and antique gems. Friday, is the destination for clothes shoppers and art lovers alike. On the first and third Friday of the month, a record fair joins the market, with an eclectic mix of different musical styles on offer, including rare and collectable vinyl. Saturdays offer a themed market each week from affordable vintage, the finest of Old Spitalfields traders, designers makers and many more. Our Sunday stallholders sell a little bit of everything, offering a market that has something for all the family. Take a break from shopping and re-fuel for the next round by stopping at Nana Fanny's Salt Beef streetfood stall. We have delicious salt beef served in either traditional beigels or Polish rye bread with pickles and salads. Cooked to our own recipe handed down since 1944, many, including Jamie Oliver reckon ours to be the finest salt beef available in London. 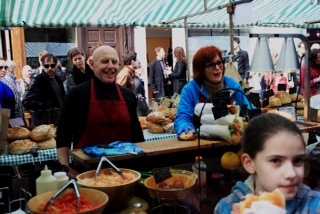 Make sure you enjoy it while taking in the delights of Spitalfields Market. Nana Fanny's Salt Beef bagels, sandwiches & falafel wraps is situated in the Green Market at Borough Market in Southwark. The place here is steeped in history and is one of the most vibrant markets in London. We are open every day here for lunch and snacks througout the market's opening times. Borough has long been synonymous with food markets and as far back as 1014, and probably much earlier, London Bridge attracted traders selling grain, fish, vegetables and livestock. In the 13th century traders were relocated to what is now Borough High Street and a market has existed there ever since. In 1755, the market was closed by Parliament, but a group of Southwark residents raised £6,000 to buy a patch of land known locally as The Triangle, once the churchyard of St Margaret's, and reopened the market. The Triangle, where you'll find Northfield Farm and Furness Fish and Game, is still at the heart of the market today. The market still feeds this core community and has grown to over 100 individual stalls. Alongside the original fruit, veg, bakers and butchers we now sell a huge variety of British and international produce. All of their traders share a love of food and many of them make, grow or rear the produce they sell so now, just as in 1755, their customers know exactly where their shopping has come from. The market ensures high standards of produce by employing a food quality panel of impartial experts who ensure that the taste, provenance and quality of foods sold here are all regularly measured and maintained and we support small traders to meet these standards. 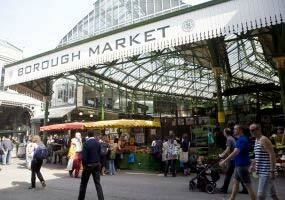 With it's vibrant and friendly atmosphere, Borough Market will always be at the heart of the local community. It's unique standing within the area has recently been marked by a Blue Plaque, voted for by the people of Southwark, marking it's place as London's Oldest Fruit & Veg Market. Borough Market is easily accessed by public transport. We're seconds walk from a major train station, on countless bus routes and even provide bike racks for keen cyclists. If you're travelling to the Market using public transport, Transport for London's Journey Planner, which you'll find to the right of this page, is a useful tool. View the Market on Google Maps. The Market is located right next to London Bridge Station which is serviced by the Jubilee and Northern Lines on the Underground and by overground trains from all over London and the south of England. To find us, simply exit the station and cross Borough High Street � you can't miss us! If you're travelling by bus, stops at London Bridge, Borough High Street or Southwark Street will leave you right by the Market. We provide bike racks so you can cycle to and from the Market. You'll find the racks in the Jubilee Market but spaces are limited. If you're using a Barclays Cycle Hire bike, the nearest docking stations are located on Southwark Street and Park Street. There are now a limited number of parking spaces available in Jubilee place for customers unable to use other forms of transport or wishing to make larger purchases. Charges are £2 for a maximum stay of 2 hrs. Jubilee place now also provides extra bike racks, electric car charging bays and mobility scooter hire. Ivan Lester has served salt beef on Broadway Market for six years, calling it a "magical market" with a vibrancy that's "like a shot in the arm" and an enduring sense of friendship between stall holders and devoted regulars. "And this," he says, gesturing to his salt beef, "is the best to be had in London." Catching the scent of it simmering in its pan of stock, bay leaves and peppercorns, one is minded to agree: here is the delicacy at its finest, the intense pink flesh, soft as butter. Ivan insists it's served in the traditional way - in a bagel, topped with mustard and pickled gherkin. So precious is the recipe, Ivan wouldn't share it, but his gelfilte fish balls are no second prize either. Broadway Market on Saturdays is a kaleidoscope of tastes and cultures: stalls, shops, pubs, restaurants and cafes offering some of the best food and most original clothing in London all crammed into a little East End street between the Regent's Canal and London Fields. But the true beauty of Broadway is that you can also shop for top-quality food at prices that are as good, or better, than the supermarkets. Perhaps that is why well over 90 percent of the people you see on Saturdays live nearby, walk or cycle to the market, and return week after week for their regular shopping. Broadway Market in London E8 runs from London Fields park to the Regent's Canal. It forms part of a pedestrian and cycle-friendly route from Hackney Empire through the park, over the canal and on to Haggerston Park and Hackney City Farm at the junction with Hackney Road. Lots of buses run to Hackney Road and Mare Street. The nearest rail stations are London Fields (a few minutes walk away, 10 minutes to Liverpool Street) Haggerston on the London Overground and Hackney Central near the Empire. The nearest tube station is Bethnal Green. There's plenty of space to park in the streets around the market. But it's much easier to walk or cycle. And the canal towpaths run all the way from Islington to Canary Wharf. We serve hot salt beef sandwiches and beigels (not bagels! Beigels being a the traditional Jewish boiled and baked rather than New York style) from a 1944 recipe which has been passed down 2 generations. Our beef is traditionally hand brined then cooked till 'super tender'. Our beigels and Rye bread (which is a polish style white rye with caraway seeds) are baked every day in Brick Lane for us and delivered warm, and we serve our beef either traditionally, which is with razor sharp pickles and fierce English mustard, or we've introduced a 'Camden special' which is the melt, containing hot beef, pickles, pickled red cabbage, sauerkraut, mustard, hot lutka's (traditional Jewish potato pancakes) and melted cheese available on either beigels or rye bread. Camden Lock Market is a fantastic day out shopping. We specialise in bringing you the very best designer makers, craftspeople, artists and specialist shops. With thousands of unique products available and an amazing selection of global food, bars and restaurants on-site, Camden Lock Market is the perfect place for a great day out. Find us at Camden Lock Market, Chalk Farm Road, Camden, NW1 8AF. (Saturday and Sunday during peaks times we don't advise using the Camden Town station due to congestion it is sometimes closed). Suitable for families all days. Camden Market is not in the congestion zone. However don't come by car unless you have to, Camden is famous for few and far between spaces . If you are thinking about doing this, consult Camden Council's website about parking. The Camden Lock you see today was once T.E. Dingwalls timber yard. Timber was unloaded from large river barges to the smaller narrow boats that plied the inland canals of Britain. As more efficient forms of transport grew the canals began to decline, and the site closed in 1971 signalling the end of an era, but the beginning of another. In 1973 Camden Lock was opened by Northside Developments Ltd as the original arts and crafts market; a makeshift collective of workshops and traders set against a rich industrial heritage. The early development revolved simply around the old wooden sheds and cobbled yards. As the first Market in Camden, it immediately stood out from London's other markets for its eclectic mix, and soon attracted the vital group of entrepreneurs and artists that first generated the Camden Town 'buzz'. For young artists, the Lock studios offered a new opportunity to rent a space where they could sell their work, and for customers the chance to see their goods being made � a rare thing in modern London. Goods are still designed and made on-site today and studios are open to the customers. During the 1980s Camden Lock's vitality began to spread. Shops up to Camden Town Tube Station, which were previously let at peppercorn rents, began to become very desirable. Camden Lock didn't stand still either. 1991 saw the opening of the Market Hall, a glass-roofed arcade designed to merge with the surrounding Victorian architecture that met with high praise from the architectural press. In 1999 the Market Hall was extended, and in 2003 the East Yard was covered with a Victorian-styled steel and glass canopy. Also in 2003 the West Yard wharf, one of the original areas first redeveloped in the 1970s was further opened up and refurbished, and the first floor walkway extended to form a terrace overlooking the wharf. Today Camden Lock stays true to its original principles and attracts both Londoners and visitors from all parts of the globe, eager to come face-to-face with some of the capital's most creative people.